format_align_justifyNASA's Insight Lander: What can Mars teach us about our planet? He was born in former Aghbaba and present day Amasiya region of Western Azerbaijan on the 5th of December, 1973. Sakhavat was also banished from his historical lands and home as many ethnic Azeris as a result of repellent Dashnak party’s policy. He was studying in the 9th grade at that time. His family first lived in Georgia for a short while and then, they moved to Lokbatan district of Baki city. After finishing secondary school # 106 in 1990, Sakhavat started working for a Construction and Repair work office # 1. He was one of the active members of Azerbaijani National Liberation Movement. He also had a great interest in arts, music, and poems. The person who loved art and music unfortunately had to take up arms to defend the Motherland. Thus, Sakhavat Mammadov voluntarily joined the army in November of 1991. He first served in Internal Troops and later, in newly established National Army. He was a brave soldier who would always use good tactics against the enemy and therefore he soon earned great respect of his fellow soldiers and commanders. He was also active involved in many important battle operations and showed a true example of courage. There was a severe and bloody battle going for the sake of Mohratagh village of Aghdara region on the 27th of June, 1992. The village, because of its strategic importance was occupied by the enemy and taken back by our soldiers many times. Sakhavat was frequently changing his position and firing at the enemy from different places. Finally, the enemy was forced to withdraw after losing their last combat machine. When the soldiers were coming back from the newly won fierce battle, they were ambushed and surrounded by the enemy. And Sakhavat was killed by the enemy bullet in this ambush. 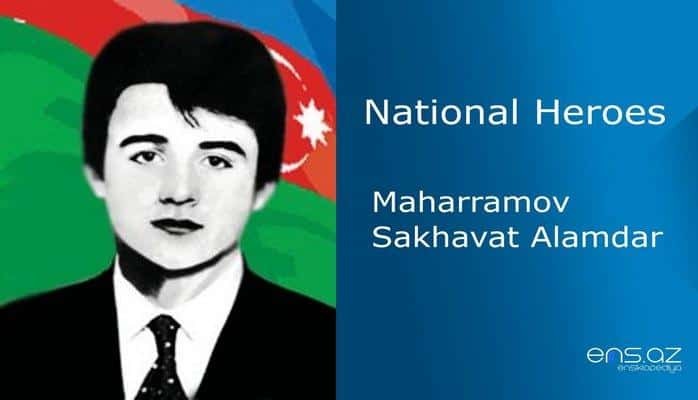 Maharramov Sakhavat Alamdar was posthumously awarded the title of the “National Hero of Azerbaijan” by the decree # 290 of the president of the republic of Azerbaijan on the 6th of November, 1992. He was buried in the Alley of Martyrs in Baki city. The school # 106 in Lokbatan district is named after the hero and there is also a bust of him in the corridor of the school.